ELISA LEONELLI, born in Modena, Italy, earned a Bachelor’s Degree from the University of Bologna, majoring in Aesthetics of Film with a published thesis on Alain Robbe-Grillet, the French novelist and filmmaker. After moving to Los Angeles she worked as a photo-journalist (1974-1989) on assignments for American and European publications (Los Angeles Times, Time, Newsweek, Westways, Zoom, Europeo, Espresso, Panorama, etc.) A member of ASMP, American Society of Media Photographers, she photographed a book on the Los Angeles Olympics (1984). She served as Film Editor of VENICE, the Los Angeles Arts and Entertainment Magazine (1990-1999). A member of the HFPA, Hollywood Foreign Press Association and the MPAA, Motion Picture Association of America, she has written feature articles about film actors and directors for international magazines (Epoca, Ciak, Marie Claire, Gioia, Donna Moderna, Cinemanía, Best Movie, Glamour, Myself, etc.) for the past 25 years. She traveled to film festivals around the world to study international cinema, earned a Master’s Degree in Critical Studies from USC (University of Southern California) School of Cinematic Arts (1997). She wrote the book Robert Redford and the American West (2007). She edited 3 books of letters and writings about the history of her family: Diario di Gisella (2007), Sinfonia d’Amore (2008), Scritti di Enzo (2010). She created a website about her travel photography, a blog about the Los Angeles dance group LA Knockers, combined several sites into www.elisaleonelli.com. 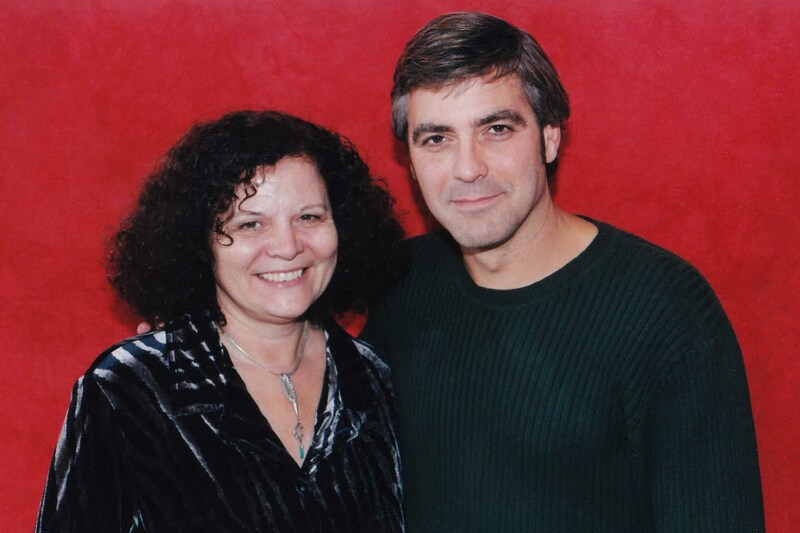 Here’s a photo of Elisa interviewing George Clooney.